Keith was born in Dundas Street in 1937; his parents owned a general dealer’s shop there until after the end of WW2 when they moved to 20 North Street. He was educated at King Street School, and after leaving there he completed a five year engineering apprenticeship at Westool in Bishop Auckland, then went on to further education at Bishop Auckland Technical College as it was then known. Afterwards he completed a 4 year Honours Degree at Loughborough University of Technology, covering 24 subjects in all. His thirst for knowledge still unquenched, Keith went on to Sunderland Polytechnic, where he completed a Post Graduate qualification in Advanced Management Sciences. But art was his passion, and for the last forty years Keith has been the principal demonstrator at major fine art shows for well known international companies like Windsor and Newton (UK and USA) Raphael (France) and Caran d’ Ache (UK and Switzerland) leading to him demonstrating techniques and materials on company stands at both the Design Centre and Olympia in London, as well as at the NEC Birmingham, the SEC Glasgow, and, much closer to home, at Gateshead’s Metro Centre. 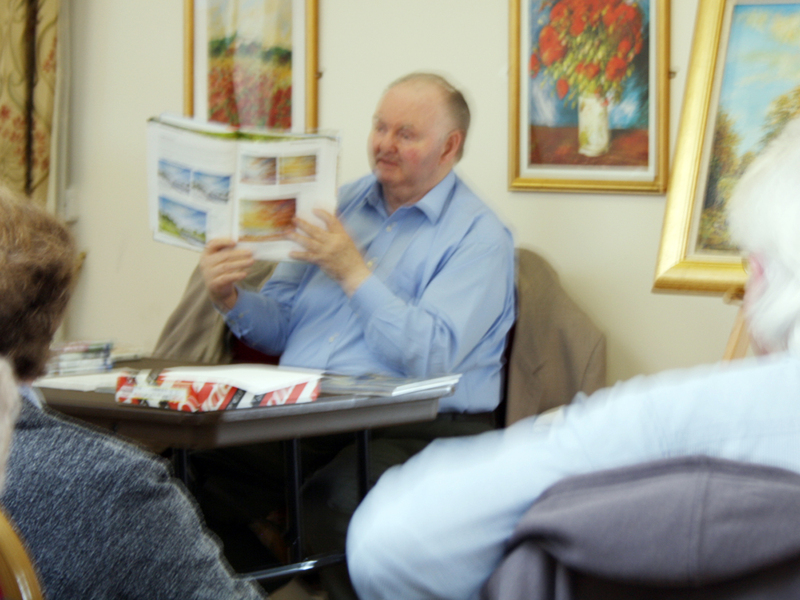 At these venues he not only demonstrated the art of landscape painting, but also ran workshops in designated Masterclass areas. As Sky TV’s Art Doctor, a programme he presented for 15 months, Keith could be seen painting landscapes three times a day, six days a week. He also went on to present “Art School” for Granada TV, and BBC’s “Eleventh Hour Challenge”. He can currently be found on Sky’s Painting and Drawing Channel on Cable. In spite of this busy lifestyle, Keith has somehow found time to author 11 books on Landscape Painting for three publishing houses: books that have been translated into Dutch, French, German, Italian, Russian and Spanish; has produced more than 30 teaching DVD’s and hosts painting holidays in Venice, Spain, Sardinia, Tuscany and Malta, as well as in the United Kingdom. Yet Keith somehow manages to cram into his already well loaded schedule, 30 or more demonstrations to Art Societies every year. Based on all of this work, its not difficult to understand why this local lad who passed good on his way to making great (artwork), is highly respected throughout the international art community. 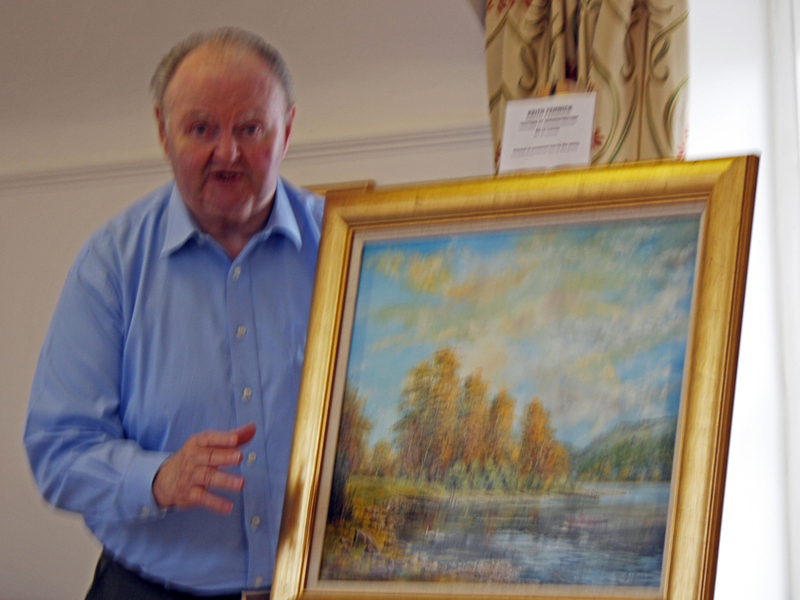 His homecoming coincided with the donation by Keith of five of his landscape paintings to the permanent gallery at Spennymoor Town Hall, housed in the Jim Smith Gallery, and, as is the case everywhere he goes, there was not a vacant chair in the Memorial Room when he was introduced by Gallery Curator Bob Abley. Spennymoor Settlement was one of a number set up in the North of England, modelled on Toynbee Hall, (named after social reformer Arnold Toynbee) which had been established in the east end of London, and came into being through the commitment of a Liverpool man, William George Farrell. 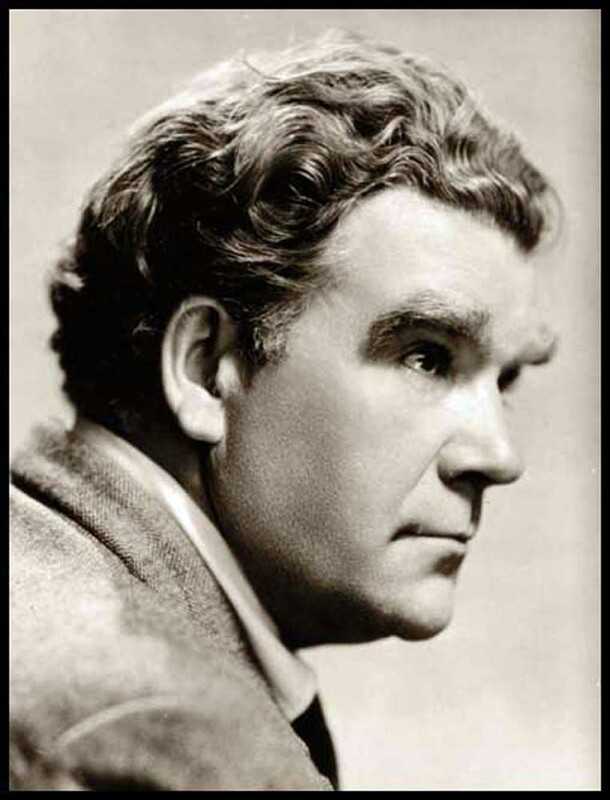 After studying at Toynbee Hall himself, in 1930 Bill conducted a survey into the effects of the depression on provincial theatrical companies. Through this he became aware of the social problems of the Durham Coalfield, and the following winter began another project, to establish the area most in need of help from the settlement movement. His study picked out Spennymoor (where unemployment was 35% of the adult population) and where most of the unemployed were miners who had nowhere to go, not even a public library. Funding for the project came from The Pilgrim Trust, founded by oil tycoon Edward Stephen Harkness, a New Yorker of Scottish extraction. Being childless, he had decided to distribute his wealth charitably, and they had been moved by the sheer number of appeals for financial help coming from Great Britain in the 1920s, to make an endowment of £2 million through a Board of British Trustees chaired by Stanley Baldwin, who is probably best remembered for serving as British Prime Minister from 1935-37. Bill made the settlement a residential one by moving into the area, along with his wife Betty (Elizabeth Ceridwen) so as to experience at first hand the difficulties being faced. The Settlement opened on 1 April 1931 in a disused shop, 38 King Street, and Bill and Betty lived in the rooms above. The scope of Spennymoor Settlement was never intended to be limited. Its doors were open to all, not just to miners, or even just to the unemployed, although the town and its environs had more than enough of those. Its aim was ‘to encourage tolerant neighbourliness and voluntary social services and to give to its members opportunities for increasing their knowledge, widening their interests, and cultivating their creative powers in a friendly atmosphere’. Those who came may have found the terminology, borrowed from the pilot scheme, rather confusing. They took the term ‘Common Room’ as implying that the users were common people, and Bill Farrell’s title of ‘Warden’ was generally misinterpreted as ‘warder’, although this was to be no prison – rather its intent was to set minds free to soar to new heights. It was natural enough that early activities centred around what Bill and Betty could offer themselves. 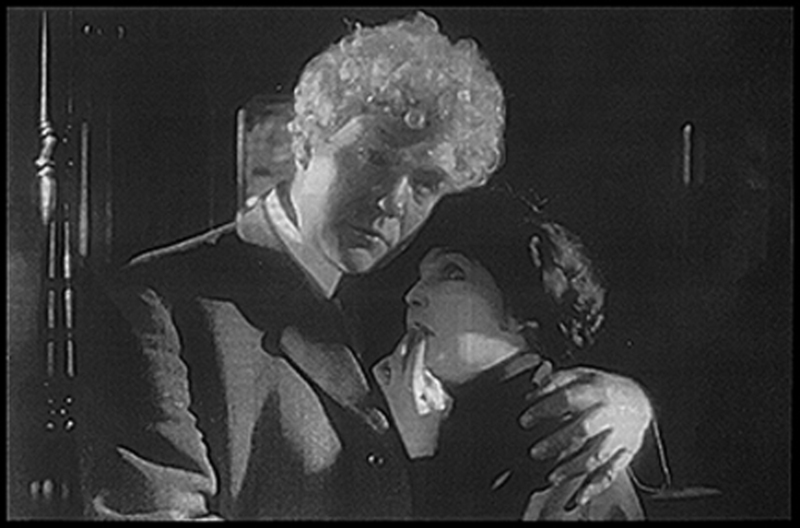 They began with a Sketching Club, born out of their interest in painting, and later added a Play Reading Group, which very quickly developed into the Settlement Community Players – forerunner of today’s locally respected Everyman Theatre Company, whose members (miners wives) were discussing the works of Anton Chekhov with a depth of knowledge and enlightenment that amazed the great writer’s British agent, and were even amongst the first in the country to study “The Method” school of acting, originated by Constantin Stanislavski. 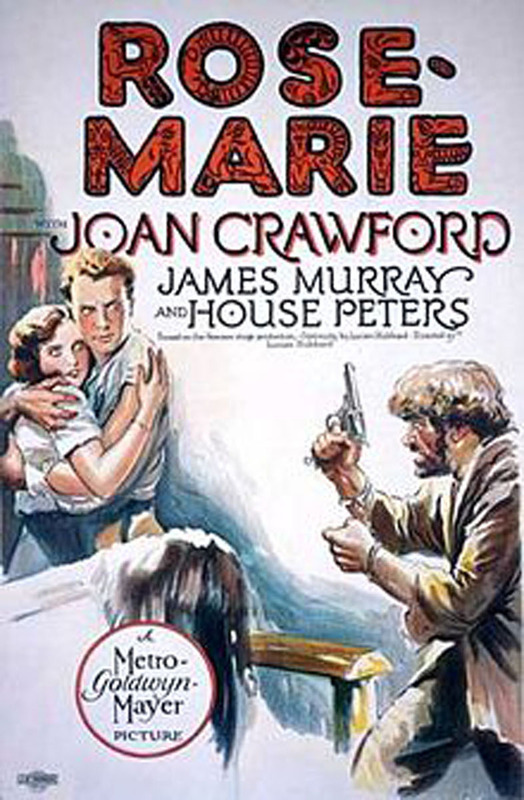 Their first play was put on in 1934 by a small group of women, mainly wives of miners, and the production utilised the skills of the Carpentry Group to make sets. A Dean and Chapter Colliery miner, Sid Chaplin, was encouraged to write plays, and Sid went on to become a leading northern writer in the 1950s and 60s. Practical classes in shoe repair and carpentry came next, with needlework for the women members. It was often claimed that The Settlement “mended souls,while it mended soles”. They added a male voice choir and a children’s playgroup, followed by studies in a variety of subjects, plus the first public lending library in Spennymoor, which Betty ran herself. The national press were quick to dub the Settlement ‘The Miners Academy’ (later ‘The Pitman’s Academy’) although the fact that the press were even noticing stemmed from a visit in December 1934 by the Prince of Wales during his tour of depressed areas, when he expressed astonishment at the quality of the paintings being exhibited. In 1935 theatrical success was recognised by an award from the Government Commission for Depressed Areas towards the building of a small theatre, the outer wall of which was adorned by a sandstone sculpture, the work of internationally celebrated artist Tisa von Hess – the late Countess Elizabeth Von Der Schulenberg, oriinally adorned the outside of the building, and this was one of the reasons for the building being awarded Grade II listing. Suffering from the ravages of time and the elements, the sculpture has now been given a place of honour in the main hall, where it is on permanent display, and a copy of the original work can now be seen in its place. Tisa’s brother was executed by the Nazis, for his part in an unsuccessful assassination attempt on Hitler’s life. 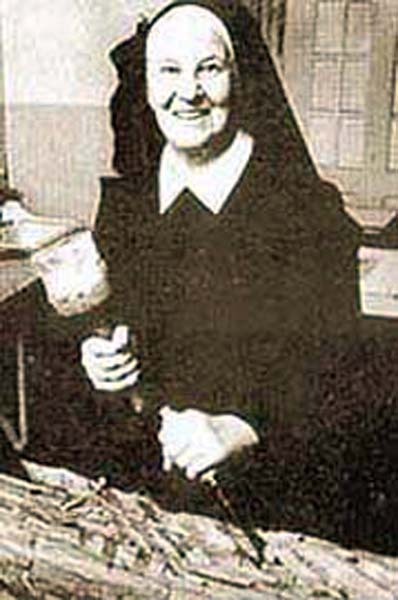 Towards the end of her life, she joined a convent and became known as Sister Paula. The history of the photograph reproduced here is uncertain. 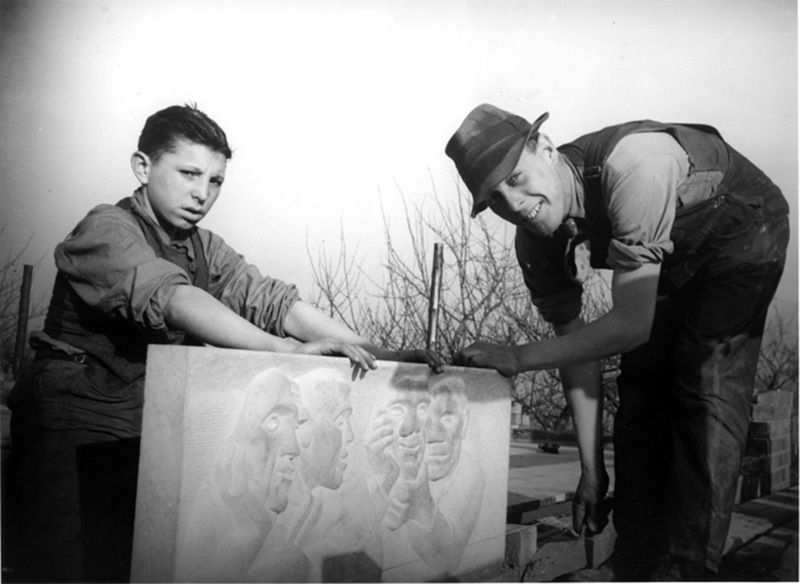 It’s believed that it shows the original stonemason and his apprentice (names unknown) fixing the carving in position and was taken around 1938/9. If anyone has any information about the stonemason or his apprentice, then Spennymoor Today – The History and Heritage Society would appreciate them contacting us, either by email to spennymoor.today@yahoo.co.uk or by using the form at the foot of this article. The modern day Settlement was refurbished to a very high standard in 2008, thanks to a series of grants, including £140,000 from Sedgefield Borough Council and £50,000 from The Heritage Lottery Fund which gave the green light to plans to conserve and develop Spennymoor’s Grade II listed building. 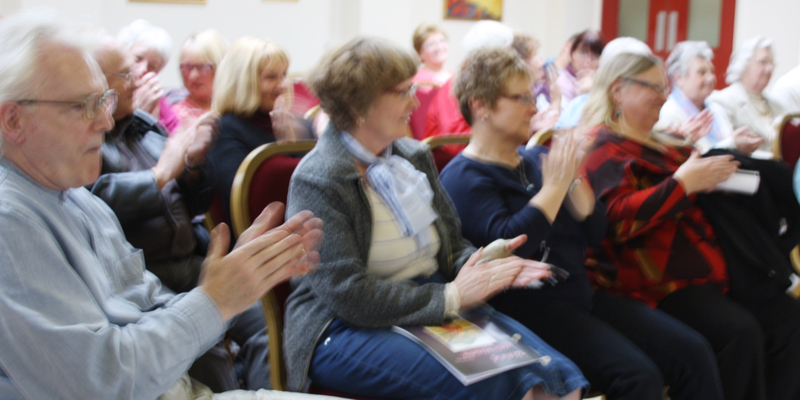 The awards ensured that all necessary funding was in place for the £225,650 project, which gave the well-loved community building a new lease of life for many years to come. The Everyman Theatre also benefited from a grant of £18,000 from Arts North East, for the provision of new stage lighting. Dr. Keith Bartlett, Regional Manager of the Heritage Lottery Fund said, “This is a great local project that has been put together thanks to the dedication of the volunteers involved. The conversion work will mean that even more members of the local community will be able to make use of the building for a wider variety of activities”. 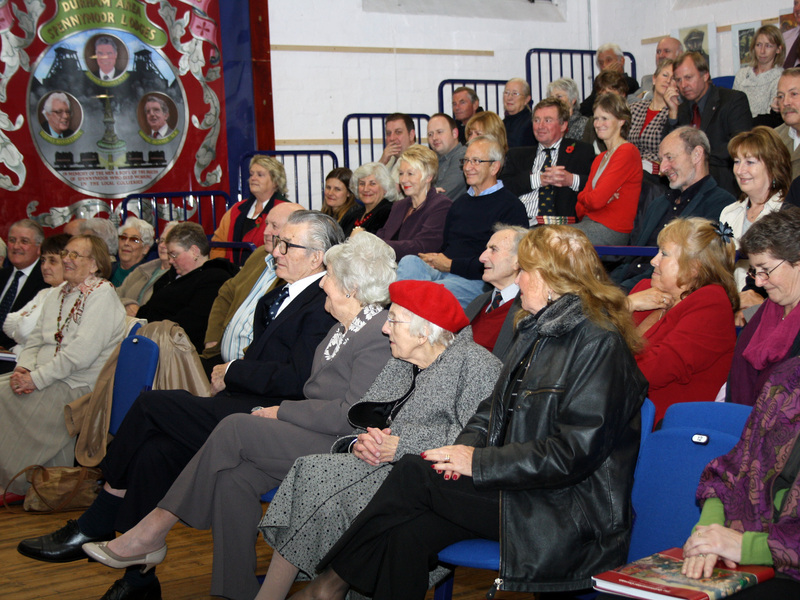 The official reopening of the newly refurbished facility was performed on Friday 6th March 2009, by Lord and Lady Foster. Lord Foster, formerly Rt. Hon. Derek Foster MP, outlined the important part the Settlement had played in rejuvenating Spennymoor during the days of depression when unemployment was high. In doing so, he paid tribute to those who had been a part of one or other of the groups which originally met inside its walls – artists like Tom McGuinness, Norman Cornish and writer Sid Chaplin amongst others. To officially open the building, refurbished at a cost of about £300,000, a ribbon stretched across the stage was simultaneously cut by not one but eight people – Lord Foster, Marion Jackson (secretary) Sylvia Dobson (president) and David Acock (chair) on behalf of the Settlement Association together with pupils representing four Spennymoor schools: Thomas Barratt (Kirk Merrington) Daniel Guthrie (The Oaks) Chloe Young (Ox Close) and Niamh Fegan (King Street). THE FACTORY THAT BURNED DOWN TWICE! 1897 must have been, in every sense, a truly remarkable year! Nationally, Queen Victoria celebrated her Diamond Jubilee – the 50th anniversary of her accession to the throne. Locally, Solicitor James J. Dodd, who had been elected a founder member of the new 21 seat Spennymoor Urban District Council as recently as December 1894, published his new ‘History of Spennymoor’. But perhaps most important of all, certainly insofar as the town was concerned, 1897 was the year when John George Kenmir of 13 Osborne Road, opened his furniture factory. Kenmir’s started quite modestly in the Old Market Buildings on the South side of High Street, but the business grew quickly, to such an extent that by the time of the disastrous Kenmir’s fire of September 1929, they had a total of seventy employees. Of the fire it was said that there was not a single place in the town from which the flames from the burning building were not visible. Undeterred, they rebuilt on a much larger scale, at the top of North Street: a three storey building, comprising machine shop, rack room and cabinet shop. On the first floor the parts were prepared and sanded down. From there they went upstairs to the rack room, where they were stacked in readiness for the next stage of their transformation. In the cabinet room, skilled hands assembled the parts into cabinets of all kinds, which went on to the polishing and spraying department. In the finishing shop locks, handles, mirrors and a variety of other accessories were added. Finally ready for dispatch, the cabinets were sent to all areas of the United Kingdom. With their quality furniture in such great demand, the company, by this time a family business, had soon expanded its payroll to about 100 workers. 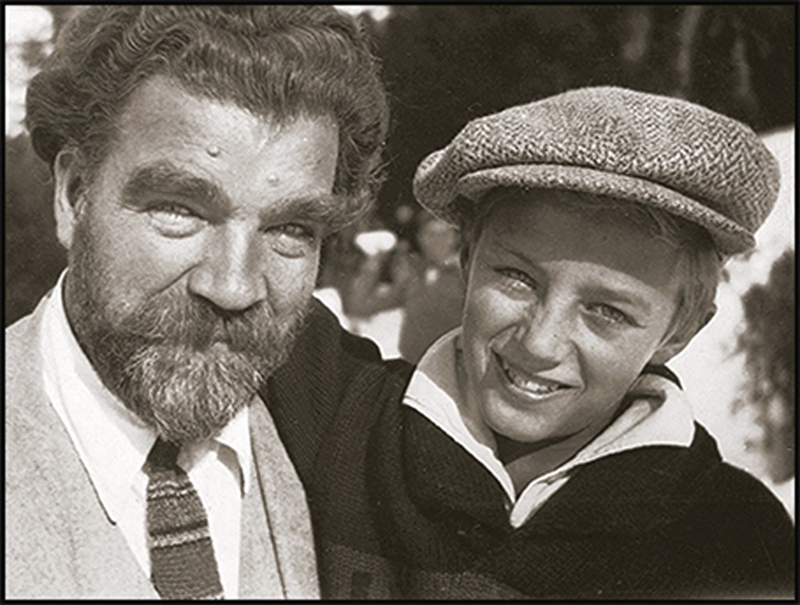 And a family business it still was; John George handed over the reins to his three sons: Eric, who became Managing Director, Frank and Carl. Working conditions were poor by the standards of today, with just one week of paid holiday in the summer, plus Christmas and Boxing Day, but employees thought of it as a good place to work, and still have nothing but happy memories of the factory, of their employers, and of the time they spent there. The big square chimney bearing the letter ‘K’ on its four sides, was a well known landmark in the town, and even folk visiting Spennymoor for the first time could not help but know where the home of fine, craftsman built furniture was. Although the factory ceased production in 1965, by which time the payroll was reckoned to be over 200, the furniture produced there by its workforce of highly skilled craftsmen still remains a much sought after item, and pieces are known to command very high prices on the rare occasions when they become available. Two reasons have been advanced to explain the closure of the business. Kenmir’s furniture was built to last – that was their proud boast – and not an idle one. Those who bought furniture crafted in Spennymoor would never have the need to replace it. Much more likely however, is the fact that, although John George’s sons happily followed in his footsteps, their sons had no feeling for the family business. Sad to say, the premises were taken over in the 1960’s and put into use as a plastics factory – which was – most unfortunately – also burned down. 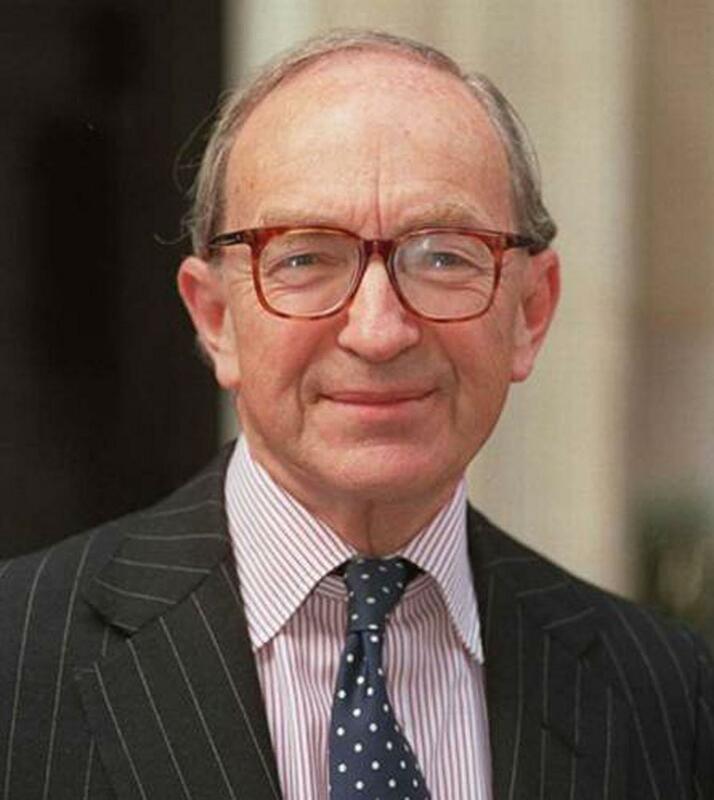 Percy Cradock was born on 26th October 1923 into a family of small farmers in Byers Green, and became a fervent Labour supporter. He won a scholarship to Alderman Wraith Grammar School and, after spending the wartime years in the RAF, was the first from his family to go to university. At St John’s College, Cambridge, he won all the prizes, got double starred Firsts in English and Law, and fell under the spell of Arthur Waley’s Translations from the Chinese, later becoming an Honorary Fellow of the College. In 1950 he was elected president of the Cambridge Union, which has, since its founding in 1815, developed a worldwide reputation as a noted symbol of free speech and open debate, beating his Conservative opponent Norman St John Stevas into second place. Cradock’s victory is said to have owed less to his politics than it did to his reputation as the Union’s best speaker by far. Later, he would write a history of the Union. He stayed on at Cambridge for a time to teach Law, then, having been called to the Bar by Middle Temple in 1953, he left Cambridge, married Birthe Marie Dyrlund, and joined the Foreign Office as a late entrant in 1954. Subsequent to that he served as: First Secretary, Kuala Lumpur [Malaysia], 1957-61, Hong Kong, 1961, Peking [China], 1962; Foreign Office, 1963-66; Counsellor and Head of Chancery, Peking, 1966-68; Chargé d’Affaires, Peking, 1968-69; Head of Planning Staff, Foreign and Commonwealth Office, 1969-71; Under-Secretary, Cabinet Office, 1971-75; Ambassador to German Democratic Republic, 1976-78; Leader, UK Delegation to Comprehensive Test Ban Discussions at Geneva [Switzerland], 1978. He was then posted back to Beijing, this time as British Ambassador, succeeding Sir Edward Youde, and he led the negotiations on the Hong Kong Joint Declaration which prepared for the handing back of the Province to its owners, the Chinese Government, earning himself the soubriquet ‘Maggie’s Mandarin’. On his previous appointment to Beijing he had been caught up in the Cultural Revolution, witnessed the burning of the British Chancery and had even been forced to run the gauntlet of rioting mobs. This time he led the British team during difficult, often tense negotiations over the better part of two years; though by the time the Joint Declaration was signed in December 1984, he had been appointed Foreign Policy Advisor to Prime Minister Margaret Thatcher, and was working from a desk in Number 10 once again. A year later he was also appointed Chairman of the Joint Intelligence Committee, duties which he continued to fulfil until his retirement from government service in 1992. In 1993 he was made a member of Her Majesty’s Most Honourable Privy Council, a body of advisors to the reigning sovereign. After his retirement, Cradock, who had always been pro-Chinese, became the most outspoken critic of Chris Patten, the last British Governor of Hong Kong, and of his liberalising policies, which he insisted would force the government of the People’s Republic to take strong action to reign in personal freedoms when it took back control on 1st July, 1997. So this Spennymoor born man, who served his country to the best of his ability, as an advisor, both to Her Majesty Queen Elizabeth II and to her Prime Minister; who was awarded the GCMG (Cross of St. Michael and St. George) in 1968; raised to KCMG (Knight of the Cross of St. Michael and St. George) in 1980 and finally to KGCMG (Knight of the Grand Cross of St. Michael and St. George) in 1983, passed away on 22nd January after a short illness, at the age of 86. Knights have always been regarded, since time immemorial as men of courage and valour. We humbly record the passing of one of our own – the death of a Spennymoor Knight. 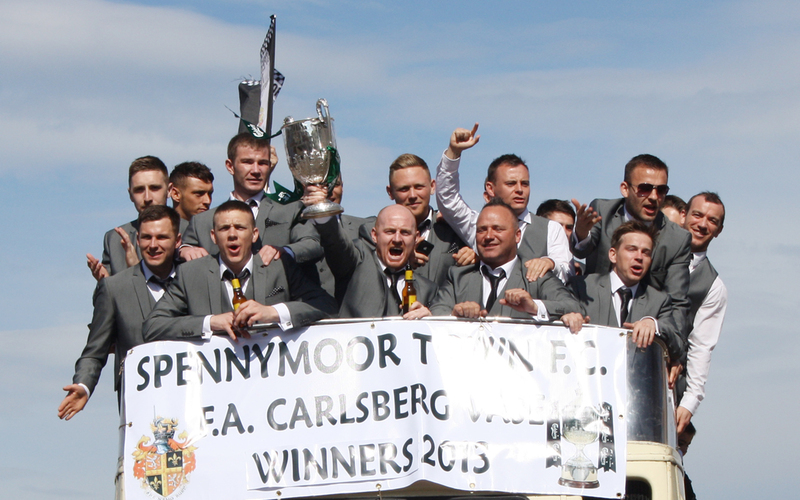 There were no sad faces to be seen anywhere, as crowds never before witnessed in Spennymoor, even on the annual Town Gala Day, lined the streets to welcome home the heroes of Spennymoor Town FC, winners of the FA Carlsberg Vase, in what will almost certainly be its last staging at Wembley Stadium. For a club that regularly attracts an average attendance of about 320 for home games, the welcoming throng even made the 4,500+ Wembley supporters seem outnumbered. Everywhere, fans, many of them wearing the familiar black and white of the club strip, lined the streets to welcome their team – and their beautiful new silverware, and it could pose a very welcome problem for the club if they all decide to attend home fixtures next season. 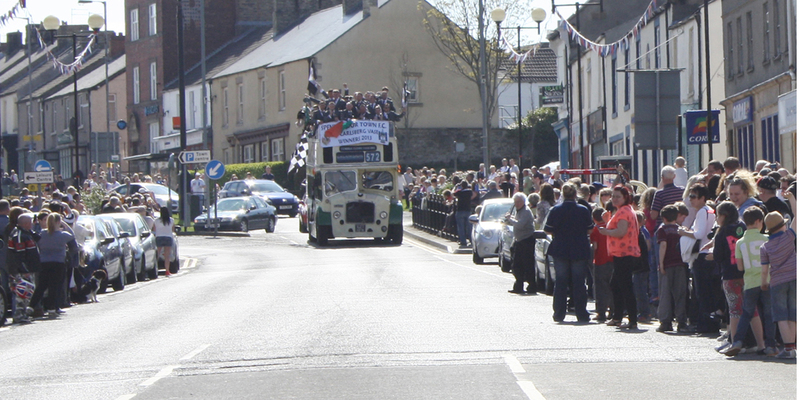 The tour of the district on an open topped bus had started at the club’s Brewery Field home, and made its way through Tudhoe, Low Spennymoor, Kirk Merrington, Middlestone Moor and Binchester on route to Byers Green. On the return leg of its journey the people of Binchester and Middlestone Moor had a second opportunity to greet them, as they travelled via Whitworth Terrace, High Street, Oxford Road, King Street and Cheapside on their way to a Civic Reception. Outside the entrance to Spennymoor Town Hall, no more than a few metres from the Wembley Club Shop kindly donated by Spennymoor Town Council, Mayor George Tolley was waiting to greet and congratulate the victorious team members, on behalf of a town that was simply overwhelmed by the occasion. Media was in evidence everywhere: and their presence was not confined to photographers, although there were more of those than you could shake a lens cap at. Just to my left, outside the town hall, a television news reporter was recording his contribution ready for transmission later that day, and Bishop FM was represented by former Spennynews reporter Pauline Fothergill. Ex Spennymoor United captain Dave Curry was present in the town centre, accompanied by a trio of lovely young ladies from Tudhoe Cricket Club – where, amazingly, play was stopped, not by rain, but so that players and spectators could applaud the team as they passed the ground! Gavin Cogden, scorer of The Moors opening goal, commented: “Scoring at Wembley capped it all for me, but I wasn’t expecting anything like today. It brings home the reality of what we’ve achieved and how much it means to the town.” Manager Jason Ainsley was equally amazed: “I’ve never know so many people turn out to congratulate a team on winning a cup,” he observed. On display along with the coveted Vase, was the J. R. Cleator Cup won by The Moors at the start of the season. With two more cup finals awaiting them – The Durham Challenge Cup and Northern League Cup – it’s little wonder the whole town is held firmly in the grip of football fever. In what may prove to be the last final staged at Wembley, Spennymoor Town survived a late scare to win the FA Carlsberg Vase in front of 16,751 fans from Durham and Kent, the highest attendance for a Wembley Vase Final in five years. Tunbridge started briskly, and produced a moment of early danger when Stanford collected the ball inside the Spennymoor half with the match just six minutes old, and the Town defence opened up for him. He reached the area before firing in his shot, but Robert Dean in the Moors goal beat the ball away to safety. That proved to be the only real threat Wells produced during the first period as the more determined Moors took a firm grip on the game, and it came as no surprise when they took the lead on 18 minutes. A beautiful cross clipped in from the right by eventual man-of-the-match Keith Graydon found Gavin Cogdon 15 yards from goal, and he powered an inch perfect looping header, beyond the reach of the diving Chris Oladogba, before peeling away to perform a celebratory hand-stand. Although the Wells keeper had been unable to do anything to deny the goal, he made an important contribution towards keeping his team in the game, and the score down to that single strike, with a series of fine saves. He was particularly alert when Cogdon made space for himself inside the box; and pushed another shot from Mark Davison around the post for a corner. Tunbridge defender Lewis Mingle almost accidentally increased Moors lead on the half hour, when he connected with Wayne Phillips’ deep cross at the far post and rattled the frame of his own goal under pressure from Davison. After the break, a revitalised and reshaped Tunbridge came out firing on all cylinders, and almost capitalised on a fumble by Dean, but the Spennymoor stopper reacted quickest, and regained the ball before any of the Wells men could take advantage. Dean did well moments later when Perry Spackman hooked the ball in from the bye-line. This time he turned it safely over the bar. From the resulting corner, Spackman connected with a powerful header, which went wide. At the other end, Cogdon continued to cause problems for the Wells back four in his search for a second goal, and a neat swivel and shot inside the box was well saved by Oladogba, then Cogdon latched onto a loose ball six yards out, but was denied by Mingle’s block. Davison also had another chance, but headed wide from Graydon’s cross, then the midfielder had a go himself – a free-kick inside the area following a back pass, that went high and wide. Then, with 12 minutes left, the Kent fans went wild with delight, when a cross from the right wing was clawed away by Dean, but only as far as Stanford, who sent his first-time volley into the unguarded net from 12 yards to level the scores, with Dean helpless. But their delight was to prove short-lived, and when Lewis Dodds ran at the defence three minutes later, a clever lay-off found Graydon unmarked inside the area, and he made no mistake, smashing home what proved to be the winner to bring the Vase back to the North East for the fifth successive year, and win the man-of-the-match prize of a bottle of champagne for himself, with just nine minutes of normal time remaining. Spennymoor defended manfully and in the dying minutes of the match, survived a vociferous Tunbridge penalty claim for a possible handball against Stephenson, and had to repel a series of long ball attacks from the Kentish men, who, with the clock ticking down, were desperate to keep their hopes, and those of their supporters, alive. Moors captain Danny ‘Bobby’ Moore, who had played a true captain’s part in spite of injury, when he left the Moors dugout to stand pitch side and urge his team on, was followed by captain on the day Chris Mason when he led the victorious Moors up the Wembley steps to the Royal Box for the presentation, and the two captains ensured Moors fans went home enraptured when they held up the Vase for them to see.